1/4 Teaspoon of Vanilla (extract). Jigger, Shaker Classic/Boston, Strainer, Grater, Saucers, Martini Glass. Pour your Coconut Rum, Cream, Milk and Vanilla over ice in your shaker. Dip the rim of your martini glass in honey and then in coconut flakes for garnish. 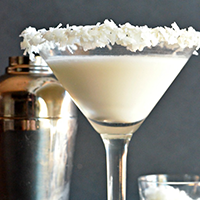 Pour your Coconut Cream Martini and enjoy!